Looking for a stable file encryption software?? Watch out for Kruptos 2, your one-stop data security center for Windows, Mac & USB Vaults (Windows Only). Lock & encrypt all your sensitive files & folders be it photos, credit card data, tax returns or any other private document. Buy Now! Encrypt your most important files, photos, movies, documents or any other files in 2 easy steps. Your files are locked even if your computer is stolen or broken into. Share your encrypted files between your Windows Computer, Mac, Android Device and iPhone. Encrypt and share your files via Dropbox, iCloud, Google Drive and OneDrive. Permanently destroy your files so common un-delete tools cannot recover them. Automatically re-encrypt your file when you're finished editing so you don't have to worry about your file being left unsecured. Create and share encrypted notes that are only accessible to you using your master password. Integrates seamlessly into Microsoft Windows Explorer allowing you to encrypt your files in as little as 2 clicks. Secure any number of files, of any size and of any type on your computer. Are your filenames sensitive? Encrypt them too. Stop using common and easy to crack passwords with our inbuilt password checker. Send password protected encrypted email attachments in as little as 2 clicks. Create Self-Extracting files for any number of files and folders as simple as in two steps with 256-bit AES Encryption. Random Password Creator plus much more! 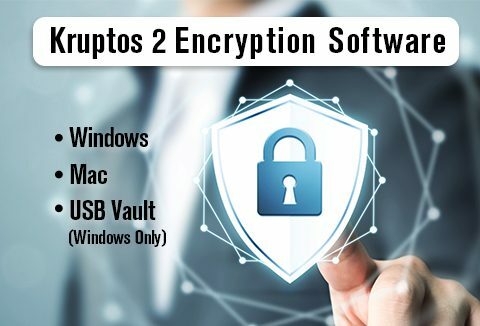 Know Your Kruptos 2 Encryption Software Well! Kruptos 2 Professional lets you encrypt your private data using 256-bit encryption, while still allowing these files to be moved and emailed as attachments. With Kruptos 2 Professional, you'll also be able to permanently remove deleted files, beyond any chance of recovery. Even if your computer is stolen, your files will remain completely safeguarded, and you'll appreciate the added layer of security that encryption provides when you're moving files from one location to another using a portable USB drive. Kruptos 2 Professional for the Mac is easy to use a file encryption program that uses 256-bit encryption to password protect your private files and prevent them from being modified, read or even accessed without the correct password. With Kruptos 2 you can password protect all your sensitive personal and commercial information including your photos, movies, credit card data, tax returns or any other private document. Kruptos 2 Go is a password protection tool for your USB Drive which protects your privacy and important data from data theft, data loss or leaks. Just drag and drop your files and folders into Kruptos 2 Go’s encrypted ‘Vault’ and they will immediately be password protected which prevents your important data from being modified, read or even accessed without the correct password. What Exactly You Will get With Kruptos 2 Encryption Software? This deal holds a Perpetual License. A Perpetual License means that it's not a recurring/subscription-based license. But the customer can keep this license as long as they want to use the same version software. The registered customers will get free version upgrades for all minor releases and bug fixes. A minor upgrade might add small features, or fix any bugs that were found in the program. Minor version upgrades are released frequently. They may do upgrade to the major version with some additional fee if they are interested. For Help Documents and links refer to the document received on the purchase order. Secure your computer today with the world's strongest technology! Using Win version Trail. Great Product so far. Good to be onboard. Great product for encrypting folders and files. I used it all the time.